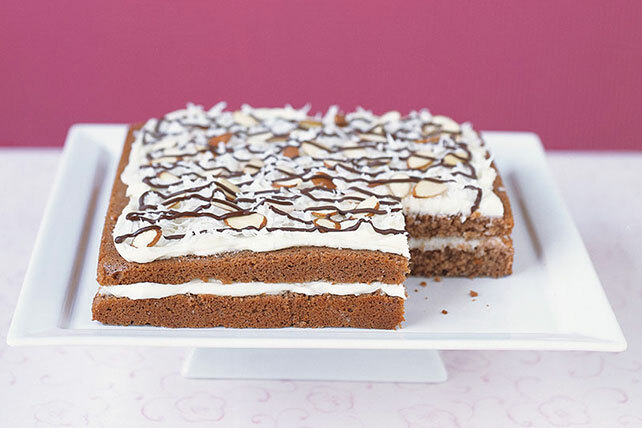 Satisfying your sweet tooth is simple with Mom's Easy Cake Recipe. Top yummy chocolate cake with cream cheese frosting for a delightful dessert. Preheat oven to 350°F. Place chocolate and butter in top of double boiler or in bowl over a pot of simmering water; heat until chocolate is completely melted. Stir in vanilla. Remove from heat. Mix flour, granulated sugar, cream of tartar, baking soda and salt in large bowl. Add chocolate mixture, milk, eggs and sour cream; mix well. Pour into greased 9-inch square baking pan. Bake 30 to 40 min. or until toothpick inserted in center comes out clean. Cool in pan 5 min. Remove cake from pan; cool completely. Beat cream cheese, butter and vanilla in large bowl with electric mixer on medium speed until well blended. Add powdered sugar gradually, beating until well blended after each addition. Cut cake horizontally in half. Spread bottom layer with half of the cream cheese mixture. Cover with top of cake; spread with remaining frosting. Sprinkle with coconut. Melt chocolate in microwave as directed on package. Sprinkle top of cake with almonds. Drizzle with chocolate. Refrigerate at least 1 hour before serving. Store leftover cake in refrigerator. Sweets can add enjoyment to a balanced diet, but keep an eye on portion size. While the cake bakes, prepare the frosting, then refrigerate until ready to use. Top the cake with toasted coconut! Spread BAKER'S ANGEL FLAKE Coconut evenly in shallow baking pan. Bake at 350°F 8 to 10 min. or until lightly toasted, stirring occasionally. Watch carefully as coconut can easily burn!